Does anything strike you as odd about the drawing? This panoramic diagram is just north of St. Pancras and Kings Cross stations in North London, just across the canal from the new location of art school, Central Saint Martins. It’s perched on the wall of an observation deck, looking south toward the train stations, up high, over what must have been the construction site people thought would never go away. I’m guessing the area has been under construction for at least 6 or 7 years, maybe more. They’ve literally built an entire new area of the city up there. London’s construction sites try to do their best to be friendly. There are directional signs and slogans about safety on all of them. When the Olympic Park was under construction in 2011, I went to the “View Tube“. This was a friendly observation deck made of shipping containers with colorful graphics telling the story of how wonderful the Olympic site would be, not only during the Olympics, but after as well. It is now a nice coffee bar and community center. 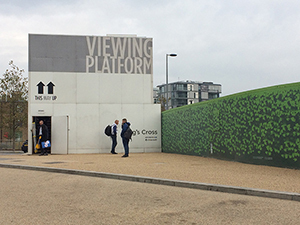 The panoramic sign on the King’s Cross viewing platform is designed to help you visualize the area and locate landmarks in the distance. Does the way it is constructed look familiar? You’ve seen panoramas before, they are helpful. But this one has something a little different. It seems to be drawn from a panorama you can shoot on your phone. It has those same subtle curves and straight roads that bend around corners. I find it interesting how digital invades our lives and changes our behaviors and influences our vocabulary. In this instance, we understand this odd, digitally stitched together “perspective” because we’ve taken and seen these types of photos. Google Street View does the same thing with straight lines. This type of imagery is part of our visual vocabulary now. We know streets don’t bend, but we accept what is being communicated. I wonder if someone not familiar with smart phone panoramas would find this image odd. If this were a traditional panorama, I don’t believe the long white building on the left would be so large and have that slight curve. The street would definitely not arc around it. The left most building is actually behind you. We do not “see” this scene like this in reality, but the camera can record it like this. In my photo, you can see how the white walls of the viewing platform are distorted. There are only three walls in this image, and they are all straight. The viewing platform is a box of four walls, all straight. During the Renaissance, artists perfected perspective drawing and painting to depict a space. Perspective is a mechanical way of drawing. People learned to understand, or “see” perspective drawing as natural. Perspective is an accepted depiction of reality, even though it is not how the eye sees a scene. I can see the same acceptance happening with this type of panoramic photography. These funky curvy lines will be interpreted as reality and accepted as a way of communicating visual information of a scene. I’m not saying creating a panorama like this is wrong, it’s just different and will look “normal” to us because of our experiences. Here I have superimposed the drawing on top of the iPhone panorama I took. It’s a very very close match, except for the building to the far right. You can see the building right of center did not exist when the drawing was created. This “normal” photo shows the two vaults of King’s Cross and the tower of St. Pancras much closer than how they are depicted in the panorama. The drawing makes St. Pancras (the pointy Victorian tower) seem very small and miles away, when in fact, it’s a 5 minute walk.